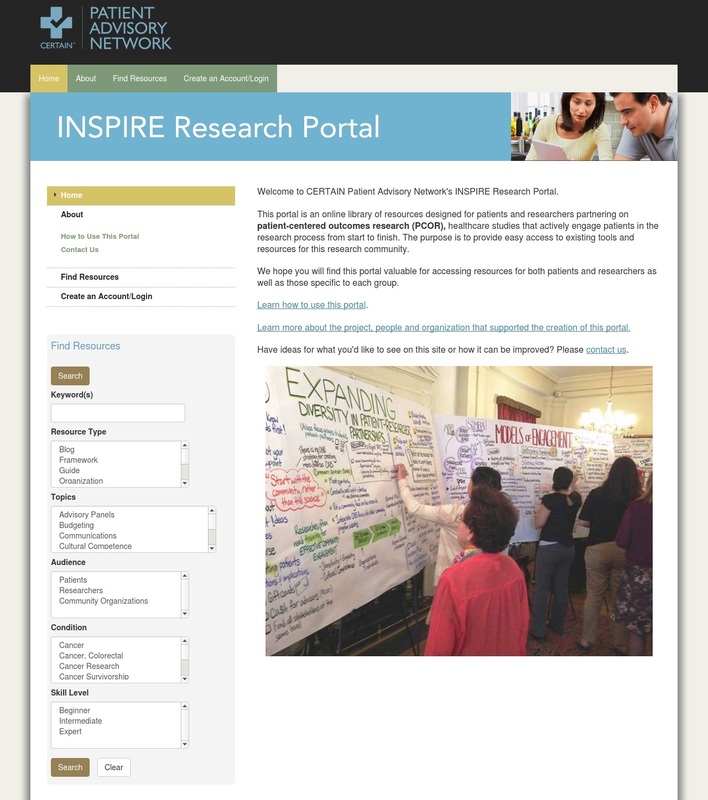 The CERTAIN Patient Advisory Network is proud to launch our new web portal, InspireResearch.org. This portal provides easy access to existing knowledge and resources for patient-centered outcomes research (PCOR), healthcare studies that actively engage patients in the research process from start to finish. It includes resources for both patients and researchers as well as those specific to each group. A primary objective is to support successful collaborations between patients and researchers on these studies. We encourage you to share InspireResearch.org with your networks of organizations and individuals who are involved or interested in patient-researcher partnerships. Your feedback is very important to us as we strive to develop a portal that is valuable to you. Please contact us with any ideas, questions, comments and concerns. Development of this portal was informed by a community of patients, caregivers, clinicians, and researchers as part of our Initiative to Support Patient Involvement in Research (INSPIRE), a project of the CERTAIN Patient Advisory Network. Being a research partner goes beyond being the subject of a trial. Rather, it means helping to guide researchers in what questions should be studied and ensuring that studies focus on the outcomes important to patients. The goal of these patient-researcher partnerships is to create high quality research that is accessible to people making healthcare decisions. CERTAIN’s Initiative to Support Patient Involvement in Research (INSPIRE) project was funded by the Patient-Centered Outcomes Research Institute to facilitate training, support and networking for these types of collaborative studies, called patient-centered outcomes research (PCOR). This 4-phase project gathered information on the experiences and needs of patients and researchers actively partnering on research projects across the Pacific Northwest region of the United States. This information was then used to develop tools such as this portal as well as resources and best practices to support future successful collaborative efforts. CERTAIN's Patient Advisory Network brings together patients, caregivers, and family members who are interested in helping doctors and scientists make research better and more useful to patients. Patient Advisors partner with researchers to provide the patient perspective to inform and improve research being done. Learn more about the CERTAIN Patient Advisory Network.